Washington, D.C. — Experts project U.S. schools will need to accommodate an additional 2.8 million students by 2024. Meanwhile, the average age of education facilities at every level has increased, and rapidly evolving student needs and technologies are making repairs, renovations and expansions critical for schools striving to remain relevant. As U.S. designers seek to satisfy the needs of a growing student population, Think Wood anticipates an increase in wood schools over the next decade. Tight timelines, limited budgets, stringent safety requirements and high standards for sustainability are also creating unique challenges for architects and developers. With spending on education building construction predicted to grow by 4.8 percent year-over-year in 2018, designing and building with wood provides solutions for the growing challenges while simultaneously helping architects and developers capture their share of this expanding market. For these reasons, the new Stadium Drive Residence Halls at University of Arkansas will be the first U.S. student housing development to use cross-laminated timber (CLT) and the first multi-story mass timber development in the state of Arkansas. Student housing solutions like Stadium Drive are in high demand, with a growing number of students attending colleges and universities. Institutions are looking for creative and cost-effective ways to expand their housing offerings so more students can live on or near campus. 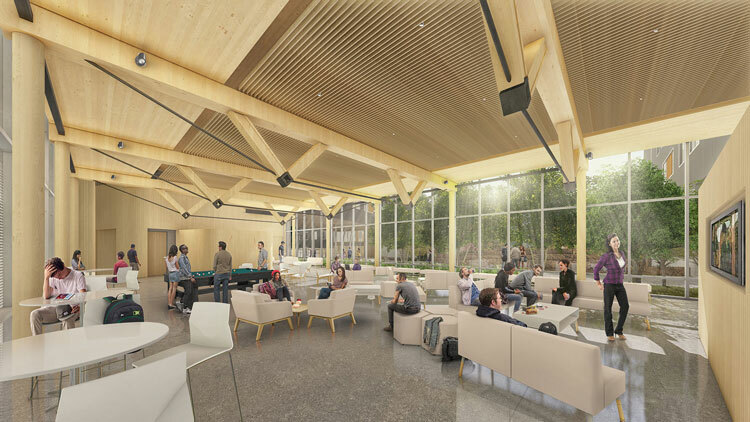 Wood construction offers rapid, modular assembly, enabling developers to get student housing facilities online in time for the new school year. These facilities can also help attract and retain students by meeting the same quality and environmental objectives as other campus buildings. For Trinity Western University in British Columbia, accommodating a fast-growing student population was a nice problem to have but an important one to solve. When the school needed to quickly expand its student housing for the upcoming school year, modular wood construction enabled a nine-month turnaround that would have been impossible to achieve using other construction methods. Trinity Western University, British Columbia Canada Modular wood construction enabled a nine-month turnaround for a 5-story 55,378 sq ft student residence using 90 modules. Image: Metric Modular. Additional photos available on request. Additional information: https://metricmodular.com/trinity. There is a strong case to be made for using wood in school construction to accommodate a growing number of students with structures that are cost effective, while also creating high-performance buildings that are safe, resilient and eye-catching. To learn more about the possibilities and benefits of using wood in education buildings, visit www.ThinkWood.com.